Egypt, Ethiopia and Sudan signed a declaration of principles on the Grand Ethiopian Renaissance Dam on Monday in a meeting of the trio’s top leadership in Sudanese capital Khartoum. 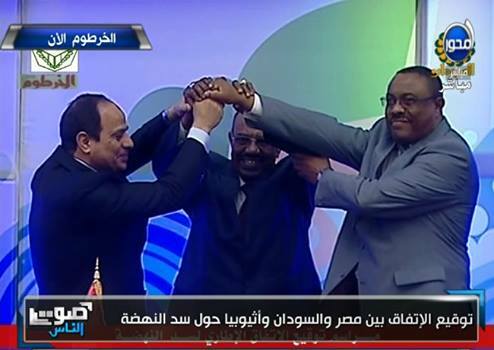 In a ceremony aired on live television, Egyptian president Abdel Fattah al-Sisi, Sudanese counterpart Omar al-Bashir and Ethiopian Prime Minister Hailemariam Desalegn signed the deal, which comes after several years of trilateral negotiations. This agreement is preliminary and negotiations between the three countries are continuing. When Ethiopia began construction of the hydroelectric Grand Ethiopian Renaissance Dam on the Blue Nile in 2011, concerns in Egypt surfaced regarding how the dam will affect its share of Nile water. For decades, Egypt has been annually receiving 55 billion cubic meters of the river’s water, the largest share, as per agreements signed in the past century. “Through continuous dialogue, we reached the starting point,” Sisi said. The Egyptian president said that instead of disagreeing, “we chose cooperation, construction and development.” He added that there is no alternative for each party other than understanding the motives of other parties. Bashir said today’s agreement affirms continued negotiations to reach further detailed agreements. The Sudanese president added that national interests cannot come at the expense of regional interests. Upon completion, the $4 billion dam will be Africa’s largest dam. It aims to generate cheap electricity to countries as far away from the Nile basin as South Africa and Morocco. The irrigation and foreign ministers of the three countries had reached a draft agreement governing cooperation between them to benefit from the eastern Nile water and the dam, in talks in Khartoum earlier this month. Sisi is scheduled to start a three-day visit to Ethiopia later today, where he will meet Ethiopian counterpart and deliver a speech in parliament.